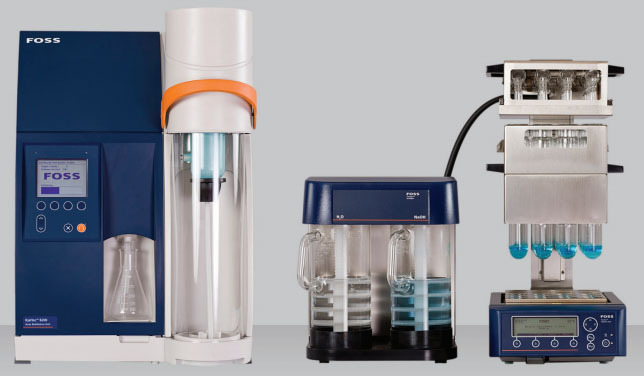 Automatic distillation for analysis of Kjeldahl nitrogen/protein, ammonium nitrogen, TKN, Direct distillation (DD), volatile acids/bases etc. (Also shown in picture; Tecator TM 20 Auto Lift and Scrubber). The Kjeltec™ 8200 Auto Distillation unit is the ultimate solution for safe, automatic distillation. Accurate bellows pumps give long term stability in reagent delivery. The unit is equipped with sensors for safety door, tube platform, distillate temperature as well as level and over-pressure sensors for the variable output steam generator. The patented SAfE* technology improves safety by a mixing procedure, reducing the exothermic reaction between alkali and acid during distillation and removing the need for manual pre-dilution. operate. The safety door and drip tray can be easily removed for cleaning. Cooling water is used only during analysis and further savings are achieved through an automatic flow control function. The Kjeltec 8200 provides the option to upgrade your unit to a complete Kjeltec 8400 analyser as your business grows. You can also add 20 or 60 place sampler changer to the analyser unit providing a fully automatic unattended operation.